Admittedly, I’ve become quite attached to my phone. I use it for everything–calls (obviously), email, Twitter, Facebook, blog reading, blog writing, Instagram, weather checks, random Google searches, photography, Pinterest, calculating, directional navigation, Goodreads, blah, blah, blah… Plus, when I’m idle, like riding in the car or waiting in line somewhere, I fiddle around with Solitaire or read an iBook. So, as fun as Vancouver was, needless to say I was a *little* high-strung about not being able to get online. I mean, if something cool happens and you can’t tweet about it, has it really happened at all? I at once tweeted a photo his artwork (YES), but I did take his message to heart. 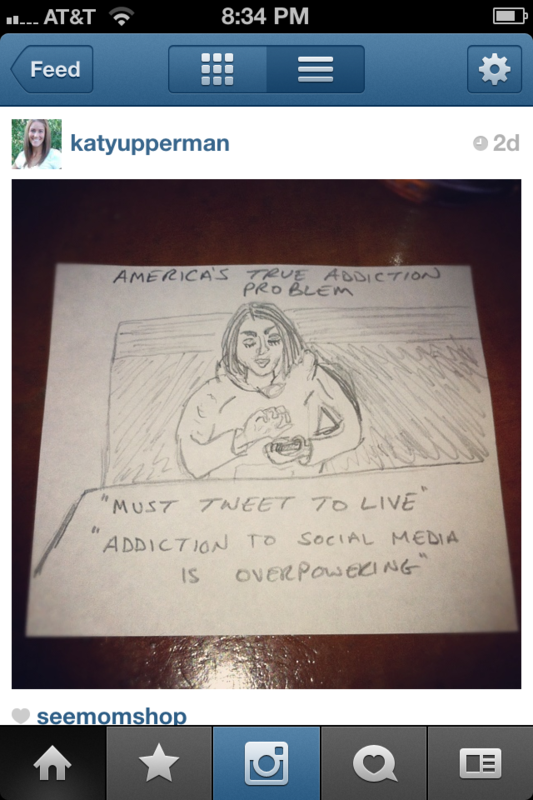 I’m Katy, and I am a social media addict. (Hi, Katy!) But here’s the thing: I don’t necessarily think my addiction is a bad thing. It doesn’t (usually) get in the way of my day-to-day activities, and I connect with like-minded people online because 1) They’re almost always awesome, 2) I learn A LOT, 3) Professional contacts are never a bad thing, and 4) It’s fun! My husband doesn’t get it at all, but to his credit, he doesn’t give me too hard a time about my love of the Internet. Thank goodness! Tell me: Are you a social media addict? What’s your medium of choice? Yeah, I pretty much cannot function without my phone. Emailing eats up my data, but I do check it all the time, and I’m forever checking Twitter or Facebook in line or making notes about my WIP on the beach or playing word games when I’m bored. Great A-post, SWF. Can’t wait to check out B! My husband would jump all over the beer/hockey idea! You and I can drink wine and write while they watch sports. 🙂 Glad to know I’m not the only technology addict around, though, I never doubted that you’d be right there with me! Email. Definitely email. I check it first thing in the morning and have been known to check it after I’ve gone to bed if I’m waiting for a message, which I always am. Laaame. It’s so nice to be plugged in, but yes… Sometimes I wonder if a (tiny) break would be good for me. I’m too addicted to attempt one, though! Oh, the few times I could get Wi-Fi in Canada, you better believe I jumped on, and shamelessly, too! I just missed my Twitter too much! Good to know I’m not alone, though I didn’t have much doubt. 🙂 I miss my online friends when I’m unplugged for too long. You guys are just too awesome! Eek, that *is* a scary thought! I walk around with my phone at home too… Seriously, what is wrong with me?! Hi Katy – I came here from the A-Z Blogging challenge. I have to say my social media addiction is Facebook and it began when I studied abroad last year in Australia. I lost my phone and had no other way of contacting my friends even the Aussie ones except in class and through FB. Now it is such a problem lol! I also am now addicted to Blogger, but I just started that. Querying is what programmed my brain to check email obsessively too. Now I’m constantly checking to see if my agent has news! And Facebook is a great way to stay in touch, especially with people who’d probably naturally phase out of your life otherwise. I’ve reconnected with so many friends and acquaintances from high school through Facebook. Love that you studied in Australia, by the way. A country that’s on the top of my Must Visit list! Oh Katy, Katy, Katy. The world did exist before Tweeting, didn’t it? Love Twitter. Lust Twitter. Adore Twitter. Obsessively check e-mail in 3 accounts. Oh, I love Twitter a million times more than I ever loved Facebook. Funny, because my Facebook “friends” are, for the most part, people I actually know in my real life. My Twitter friends, on the other hand, are mostly people I’ve never met but would love to! I hate my cell phone… I don’t understand the need for the technology. Kidding… what time is it? Great start… to the challenge “A” is for Awesome! Thanks, Jeremy. Your comment totally made me laugh. 🙂 I’m having fun with A-Z already… so glad I decided to participate. Thanks for co-hosting! I have a completely unhealthy attachment to the internet and my laptop. That’s why I have not allowed myself to get an iPhone, despite being a lifelong Mac person. I know myself, and I know if I had a smartphone, I might as well move into a cave and leave the real world behind! Yeah… I never thought I *needed* an iPhone, then I got one. Now I don’t know how I survived life without it! Lately, I’ve been keeping mine on vibrate and I find it sort of liberating. I’m not jumping up every time I hear a text chime or a ring tone or an email notification. I’m thinking vibrate might be the way I’ll go from now on. Loved this! I can absolutely relate. I’m trying NOT to get into pintrest, stumble upon etc…because I already spend a lot of time online…I use facebook, blog and twitter and balance having twins. And as I type this my husband is moaning at me because he is cleaning out the garage and I am blogging! Yikes! Stopping by from the A-Z challenge. Now this, is a letter I can TOTALLY get behind, Katy!!! I have an addiction…to my cell phones. Yes, that’s plural. One for work and one that’s personal. So when I’m sitting at my desk, pretending to do work “things”, I have 2 cell phones, one desk phone, my iPad, and my MAC, all in front of me (yikes, I just read that back and realized how bad that sounds). And if my husband had any artistic talent like your husband does, I can assure you we’d have very similar pictures! My name is Erin, and, like Katy, I am addicted to my cell phones. Oh, Erin! If I had TWO phones to deal with, I’d never see the light of day! And yes, we did set up for the roaming international service, but only in case of some emergency with our daughter. It was way too expensive to use just for social media! Yes! Querying is what did me in as far as email checking too! Now, it’s an impossible habit to break! I have to say hubby’s a pretty good artist. Maybe you should tweet more of his work. I’m a blog and e-mail junkie. I don’t have a smart phone so i’m constantly checking my pc – desktop or laptop. My hubby says I’m going to get sucked into the computer. scary thought. If he completes any more sketches, I’ll definitely post them. 🙂 And I love that you exchanged email addresses with people at Busch Gardens… awesome! My husband detests social media. He endures my engagement with it as long as I don’t involve him. My husband also thinks I´m an addict and let´s face it, I probably am. The first thing I do (before I even get up) is checking my email and it is the last thing I do before going to sleep. I´m probably more of a Twitter addict than Facebook at the moment which is funny because like you, on Facebook I do actually *know* *know* the people while on Twitter, I almost never met anybody I talk to. And I am definitely addicted to blogs! My media of choice: Facebook, Tumblr, and Twitter. So far, I’ve resisted the shine of Tumblr, but it’s oh-so-difficult. I’ve already got enough online stuff going , what with Twitter and blogs and Pinterest and all. And yes, thank goodness for like-minded online friends who TOTALLY get it! I love that drawing. Hilarious. Dude…I am the WORST addict. My anxiety level over the status of my phone battery charge is actually embarrassing. I have 2 fb accounts, 2 twitter accounts, and I have recently started using Tumblr, which I love, in addition to my blog. It’s ridiculous. A cell phone for car use only is probably the most responsible thing I’ve ever heard, Colin. Your strength awes me. 🙂 And yes, I’m not a huge Facebook fan either. I much prefer the awesome of Twitter. I am always messing with my phone too. Sometimes it’s playing a game, but most of it’s email, Twitter, Google searches, etc. I think I’m more of an Internet lover than social media though. I like it, but I’m not addicted. Out of the different medias though, I enjoy Twitter the most. I used to be an aohell addict, then later I spent a lot of time on MySpace, and now I spend more time on Facebook, though I’ve cut down on how much time I spend playing games there. After all, writing comes before games. My real addiction has long been computer games. I don’t want to know how many hours (probably adding up to months or even years!) I’ve ever spent playing Tetris, various Solitaire games, and various Mahjong games! Once I started playing at 16 (back in 1996), I was hooked!